Auditing 10 Edition As today's auditing environment continues to change in dramatic ways, those entering the profession must be prepared to handle a high standard of responsibility. 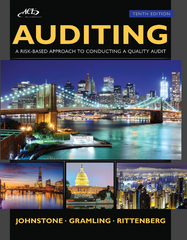 You can prepare with the help of AUDITING: RISK-BASED APPROACH TO CONDUCTING QUALITY AUDITS, 10E. AUDITING reflects the latest clarified auditing standards and the newest PCAOB standards, while discussing the COSO's Internal Control-Integrated Framework and the AICPA's recently issued new audit sampling guidance. You'll find the most recent professional developments with a new integrated emphasis on the latest fraud risks and ethical challenges throughout the book. New end-of-chapter problems as well as new cases provide valuable hands-on experience.